screen printing, pick and place and reflow oven. ILAS is optimized for the production of small series with innovating processes of electronic components transfer. 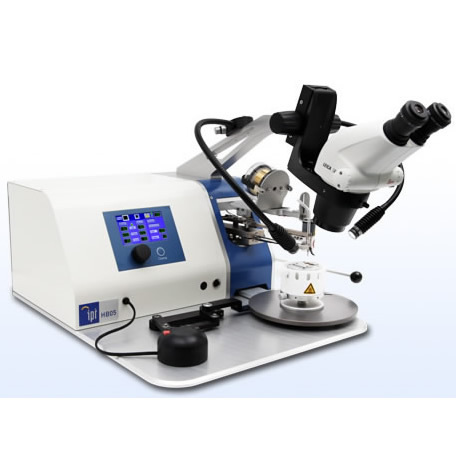 As basic version ILAS includes a continuous laser heat input YAG of 600W. This power allows the lead frame to reach a temperature of 250°C within 2s. The spot size is configurable from diameter 4 to 16mm with a « Top Hat » energy distribution. The temperature is homogeneous on the subordinate face of component. The overheating power is piloted throughout the process. • Programming: The Man�\Machine�\Interface (MMI) allows the operator to select the program to be used during his manufacturing campaign. Beforehand programs are created on a user�\friendly interface in the form of steps. These steps define the component sintering/soldering process. • Process tracking: During the process cycle, displacements and force are displayed in real time on MMI. The operator can keep track of the process and check that the transfer cycle complies with scheduled sequences. • Analysis and post�\treatment: Parameters and data are saved for post treatment analysis of events that occurred during process cycle. This analysis allows process improvement and the combination of laser with electromagnetic head operation.